Gender does exist in Epiphany despite the gender-neutral pronouns. There are just more genders. Most are based on a concept called hjathoma to the Sabaji Tveshi, hụkepli to the Hicịptụ, and yadokyozị to the Ịgzarhjenya. The Iturji concept of hjathoma is strongly related to that of the Sabaji Tveshi. Information on which genders exist in each group. A primer on how gender works in naming. How to use basic descriptive evidence to understand status and gender. If you want something longer, visit the verbose version of this page. Hjathoma matters. People assigned female at birth (AFAB) have it by default. Hjathoma is most evident in the legal code that governs who has the marriage rights to stay within ler maternal family. A woman marrying a non-woman has staying rights. A woman marrying another woman becomes a complex dance of legal codes to determine who must join whose family. In addition, only an AFAB women born to ler family of residence can become a matriarch. The Sabaji Tveshi have three genders: Women, men, and jomela. The jomela category is a legal gender status for AMAB (assigned male at birth) children who present in a feminine manner. This can include things that Americans would consider distinct genders. The Sabaji Tveshi have no mechanism for legally recognizing AMAB women or AFAB men or AFAB jomela. Because the nuamua run the medical schools planet-wide, Sabaji Tveshi doctors know the biological basis and will often treat people without family approval because they have sworn medical oaths to the gods. The Iturji have four genders: men, women, jomela, and kaju. The kaju gender category is a legal status for AFAB who are not women. Kaju have hjathoma against all other genders but women. They also take responsibility for a set of important religious rituals for the goddess Liķra that only kaju may perform. Jomela in Iturja are similar to jomela in the Sabaji Tveshi territories. However, Iturji jomela have key positions in the priesthoods of the goddess Liķra and deities who transcend gender. The jomela and kaju of Iturja are associated with Iturji separatism, as Iturja ideologically considers itself an ideal blend of the Ịgzarjhenya and Sabaji, as supported by their patron goddess Liķra, who delights in intermingling. The Iturji, like the Sabaji, do not have a mechanism for AFAB to become men or jomela, nor do they have one for AMAB to become women or kaju. The Ịgzarhjenya have four genders: men, women, ozkyev, and yadzakma. The ozkyev are similar to jomela in Iturja. They are dedicated to the gods Yilrega, Kanuga, or Migäsra in a ceremony and typically retain strong relationships with these gods for life. A yadzakma violates gender roles. The best way to describe it is to compare it to categories like genderfluid or genderqueer or agender — but all at the same time with a religious dimension added on top like a cherry. One typically files for recognition with ler matriarch in ler teens. It’s celebrated with a party. Yadokyozị in marriage will be decided based on a sacred dice roll in a temple of Tsemanok. Other genders exist in Ịgzarhjenya regions, too — these are typically endemic to specific areas, with clear sets of social roles among their communities. The Ịgzarhjenya recognize transgender women (gesev) and men (ozev). These terms are usually used in pre-Sabaji conquest legal documents, medical information, and political pamphlets. Otherwise, the terms are not commonly used. Most transgender men live in monastic communities devoted to the God of War, Narresan/Nardresan. Some participate in the worship of Migäsra instead. Ozev are trained in the art of war from a young age, so they are suppressed intermittently by the Sabaji. Likewise, the Sabaji refuse to put legal hjathoma language for gesev into Tveshi legal codes. The treatment of both drives a lot of Ịgzarhjenya into militant separatist movements. The Hicịptụ recognize three genders: men, women, and hụkna. A hụkna may have been assigned any gender at birth, but are inducted into ler new gender status during prepubescence. The Hicịptụ do not care about Sabaji-enforced gender laws because enforcing those laws in the Deep and Middle Depths of the Canyons would not be scalable. Depending on the tribal area, other genders may be recognized. For the examples in Tveshi, I am going to use the word karatị, which means oratory in English. Men’s names typically end in -(h)au, -(e)tvi, or -(h)ao. Thus, Karatau, Karatetvi, Karatao. Women’s names usually end in -(h)añi, -(h)ar, or -(e)ti. Women’s names may also begin with the prefix añi(h)-. Thus, Karatañi, Karatar, Karateti, Añikaratị. Jomela often use the masculine -(h)au ending because it is etymologically unproblematic (it comes from a word that can mean either traveler or husband). The -(h)ao masculine name ending is considered problematic in progressive circles. Jomela often retain birth names, but if their names are changed in the complex ancestor rituals a name change requires, they blend masculine and feminine name traits, but not añi(h)- or -(h)añi. There is also a special suffix, -(h)ejo, that jomela may take. Thus, Karatị or Karatau or Karatar or Karatejo or Karatauhar or Karateti or Karatauti or Karatetihau or Karatauti. Takeaway? You don’t know if someone with the -(h)au ending is a jomela or a man, and you don’t know if someone with either the -(h)ar or -(e)ti suffix is a woman or jomela. Jomela make up 5-7% of the Sabaji Tveshi population, but go into external-to-household professional fields at a higher rate than the other two genders. In any Sabaji language, nouns or adjectives are also used as names without applying a gendered suffix. The name Nita, for example, does not encode gender! The suffix -(h)ah can be given to any gender. Añikaratah, Karatah, Karatị. Many people also use the root, or a shortened form of the root, without the ending for nickname forms of their names. Karatau becomes Karatị or Kara, for example. Heivenau becomes Heivenė or Heivė. Thassañi becomes Thassa. Ịgzarhjenya languages (and Menarki/Menargi Narahji is modeled here) are simpler. Many women have names ending in -us, -ta, -is, or -ar. 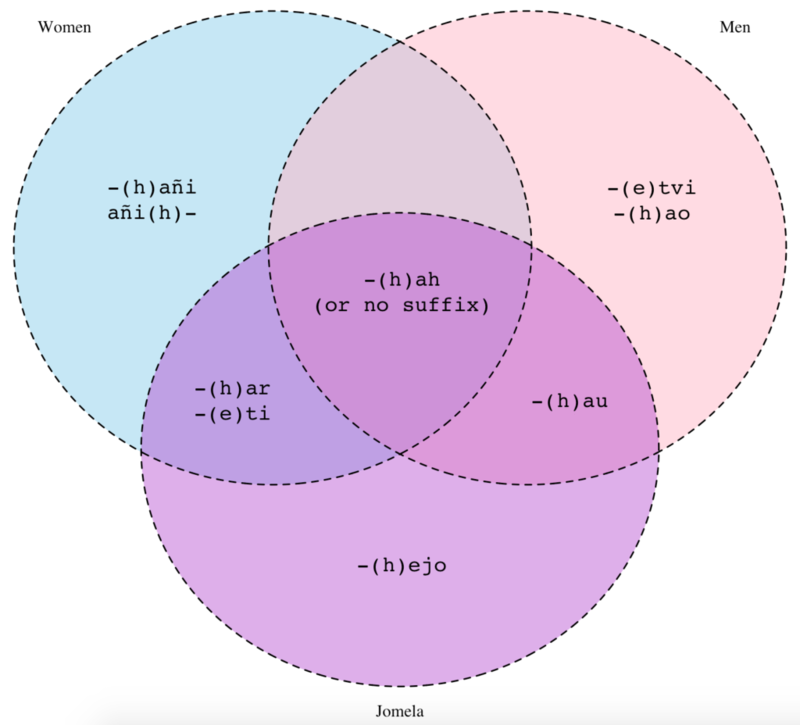 Some women in cosmopolitan areas (e.g., Menarga) will add Sabaji suffixes, or they will name family members in the Sabaji style using Narahji and/or Tveshi names. They may also use Tveshi words with feminine Ịgzarhjenya endings, or they may add either or both Tveshi and Ịgzarhjenya endings! Salus has the root salị. Le could also be named Salta, Salis, or Salar. Other genders generally have names that are a noun or adjective with a prepositional suffix, but women can also have names formed like that. Further, several normal grammatical suffixes (-tis, -mis, -xus) can be mistaken for honorific suffixes in Narahji. Thus, gender is a bit more ambiguous. Gender is culturally encoded — an example being, if I asked you to picture a lawyer in your mind, most of you would picture a man, but most Tveshi would picture a jomela. A family matriarch is the archer. Ler strategic vision is the bow. Members of the family are ler arrows. The goal of a family member is to hit the target. Everyone must submit to that authority. In Tveshė, people would code domestic politics as a feminine field and foreign politics as a masculine field. Domestic politics and policy is seen as an extension of the household, which is run by women. Women are seen as well-suited to theoretical scientific positions, while men are seen as good engineers and applied scientists. Other genders are seen as good team leaders and managers. The medical profession is gender-neutral. Men have mandatory military service and free passes to gymnasia where they are required to keep up. Women and jomela/ozkyev take upper-level command positions in the military, and there is a taboo against women using weapons that are not ranged. Women and jomela/ozkyev are seen as naturally good snipers and archers. Men are seen as superior in military combat that requires muscular force. Jomela and ozkyev tend to work in liminal occupations, such as negotiation, high-ranking diplomatic offices, trade, law, and navigation. Jomela and ozkyev are seen as a blend of masculine and feminine traits that are all “lucky” in those industries. Other jomela and ozkyev occupy key religious positions in the priesthoods of Likhera, Yilrega, Kanuga, or Migäsra. Almost all yadzakma are priests. Tveshė, because it is ruled by the Sabaji, does not recognize yadzakma or transgender individuals, especially transgender men, despite the Ịgzarhjenya coalition for culturally sensitive regional hjathoma laws in the Senate. One of the main points of the Ịgzarhjenya coalition is that people seeing their relatives hurt by the government just drives more families into the separatist groups. Yadzakma and transgender individuals are 100% supported by their families, and many families will even bribe officials not to notice if Tveshi hjathoma legal codes are not enforced. Women wear headdresses, and Narahji women wear veils over their hair before marriage. It is taboo to touch an unmarried woman’s hair even in areas where veiling is not practiced. Women, jomela, and ozkyev all double-bind their hair (braids/dreads that are then put in braids, buns, or upsweeps), but women are the most elaborate. “High double-bound” means wearing double-bound hair with a headdress. Only women (and extremely daring jomela/ozkyev) may do this. Non-men often wear braids or dreads in simple buns as an everyday style. The marriage ritual involves shaving a woman’s head in a “rebirth,” so a large percentage of married women choose not to grow their hair out again. Deo’s not-designed-to-look-natural fabric wig is one example. Men wear a variety of unbraided buns, upsweeps, or ponytails (single-bound). Men cannot wear headdresses. Doctors are special. Doctors have shaved heads. Men wear knee-length dresses in summer, and women’s summer dresses are shorter. Men cannot wear aniku — but jomela/ozkyev can. Women only paint their faces as part of religious rituals, when it’s typically patterned henna or just coating one’s face with ash. Among the Sabaji, yellow, green, silver, black, and gray are considered masculine colors, and women won’t wear clothing using those as the main color because they view it as demeaning. Men also wear face paint in vertical or horizontal stripes and lines. Jomela/ozkyev and yadzakma occasionally wear face paints, but in dots, never in lines — lines are masculine. In Ịgzarhjenya and Hicịptụ cultures, colors are not associated with gender, but specific sets of colors are. The Sunset Pattern and Dawn Pattern are two examples: They mean that a person is powerful enough that ler will rules over day and night, and few non-women would have the audacity to wear them. Yadzakma, unfortunately, are targets outside of majority Ịgzarhjenya areas because they practice the sacred violation of gender norms in clothing — but their families and towns protect them if possible. Note that this is just in Tveshė. Ameisa has many more cultures than just the Ịgzarhjenya, Sabaji, and Hicịptụ. The other worlds also have many cultures. I could talk about the sselē of Atara or the zolyi of Laseå if I wanted. The point is that all of these roles have deep cultural contexts and that this is a reason behind gender-neutral pronouns.